Cities is a style based on architecture and and the principle of Bauhaus, which has its roots in the early 20th century and seeks essential form over decorative purpose. Cities’ design is conceptual, multiplicable, clean-lined and has a consistent identity. Jewelry oversteps its traditional role as a sign of rank and takes on a new complex function as symbol of lifestyle, affinity and personal identity. Discerning consumers continue to favour extraordinary craftsmanship, valuable gemstones and precious metals. CADEAUX JEWELRY Cities is unmistakably of German origin with geometric lines, broad surfaces of precious metal and carefully set diamonds, characteristics that lend Cities a classic beauty and a distinctly modern jewelry identity. CADEAUX JEWELRY’s ultimate modernist product in 18 karat white gold with 2 rows of diamonds, 1 on top and 1 on the side of the bangle. 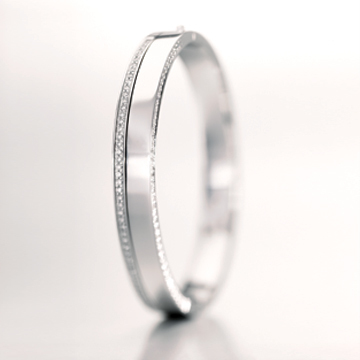 Bangle Hamburg exemplifies the use of clean and precise geometric lines, broad precious metal surfaces and perfectly set diamonds, and it outshines the concept with a simplicity that is both remarkable and spectacularly beautiful. The features can only be achieved with extraordinary craftsmanship and a high sensibility for modernism. 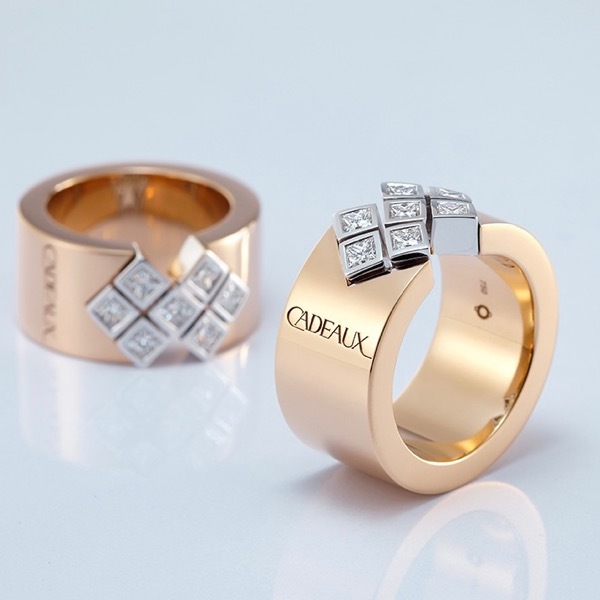 CADEAUX JEWELRY Hamburg is the essence of a distinctly modern jewelry identity. 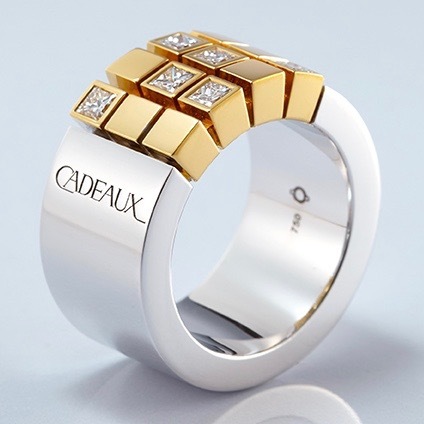 The ring that matches CADEAUX JEWELRY’s ultimate modernist bangle Hamburg. 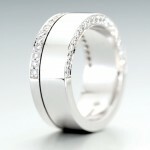 Made of 18 karat white gold with 2 rows of diamonds, 1 on the top and 1 on the side of the ring band. Like the bangle, ring Hamburg exemplifies the movement toward clean and precise geometric lines, broad precious metal surfaces and perfectly set diamonds, features that are achieved with extraordinary craftsmanship and a high sensibility for modernism. 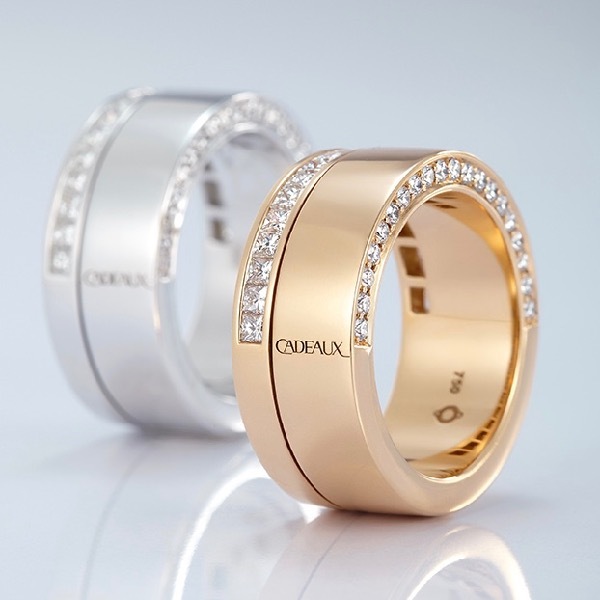 CADEAUX JEWELRY Hamburg is the essence of a distinctly modern jewelry identity. Princess-cut diamonds replace round brilliant-cut diamonds on the upper band of this ring, which is otherwise identical with CADEAUX JEWELRY ring Hamburg. 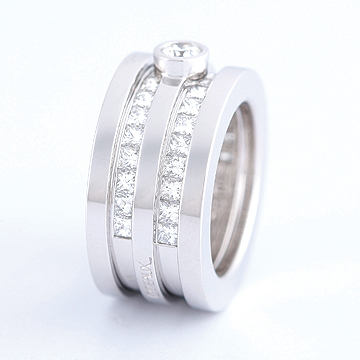 Made of 18 karat white gold with 2 rows of diamonds, 1 with princess-cut diamonds on the top and 1 with round brilliant-cut diamonds on the side of the ring band. Also this edition exemplifies the movement toward clean and precise geometric lines, broad precious metal surfaces and perfectly set diamonds, features that are achieved with extraordinary craftsmanship and a high sensibility for modernism. Bangle Berlin gives prominence to modernist design aspects adapted by CADEAUX JEWELRY: precise geometric lines, broad precious metal surfaces and perfectly set diamonds. An architectural construct that combines elements requiring the highest level of craftsmanship, all from the designer, goldsmith and stone-setter. 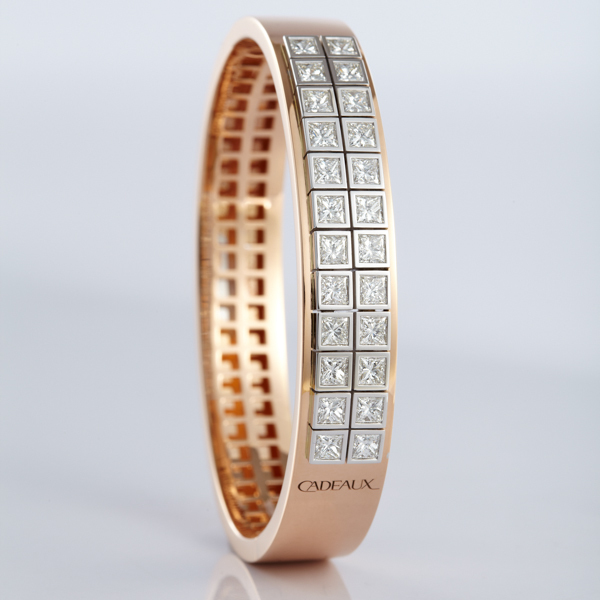 The combination of a broad and prominent 18 karat rose gold bangle with 2 rows of perfectly aligned 18 karat white gold settings holding 24 fabulously radiant princess-cut diamonds provides a riveting edifice. It reflects value and a high sensitivity for modernism, a combination that galvanises the observer and defines the wearer. Ring Berlin accentuates the modernist design aspects adapted by CADEAUX JEWELRY: precise geometric lines, broad precious metal surfaces and perfectly set diamonds. These are elements achievable but with the most extraordinary craftsmanship. The combination of a broad and prominent 18 karat rose gold ring band inset with 3 rows of perfectly aligned 18 karat white gold settings holding 12 fabulously radiant princess-cut diamonds provides an irresistible contrast. It reflects class, traditional rank and a sensitivity for modernism, a combination of virtues rarely reflected in a single piece of jewelry that galvanises the observer and defines the wearer. Ring Berlin 21 is built the same way as Ring Berlin. The difference is that the 12 cubes are made of 21 karat gold, and are only partly set with princess-cut diamonds. The piece also reflects precise geometric lines, broad precious metal surfaces and perfectly set diamonds, elements achievable but with the most extraordinary craftsmanship. The ring combines a broad 18 karat white gold ring band inset with a 21 karat gold settings holding 7 radiant princess-cut diamonds. It reflects class, masculinity and a sensitivity for modernism. Ring Berlin Cube features an exquisit variation in the way the ring head is mounted in a diagonal manner. 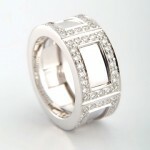 7 cubes are made of 18 karat white gold, and are all set with princess-cut diamonds. The piece reflects precise geometric lines, and a mind-teasing arrangements of cubes over a bent diagonal, an aspect achievable but with the most extraordinary craftsmanship. The ring combines a broad 18 karat white gold ring band inset with a 18 karat white gold settings holding 7 radiant princess-cut diamonds. It reflects class, exclusivity and a sensitivity for modernism. 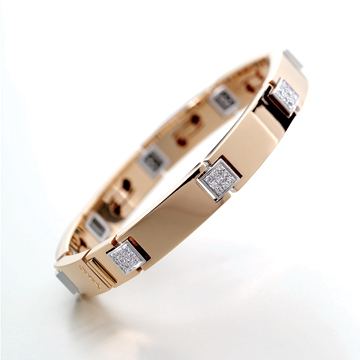 Bracelet Koeln is constructed with modernist elements: square 18 karat white gold links pave-set with diamonds that are alternately and flexibly coupled with elongated 18 karat rose gold broad-surface joints. The conceptual design of this bracelet makes it flexible specifically in the vertical axis only, and only to a degree, ensuring that the bracelet keeps it precise form and lies on the wrist in a predetermined way without the character of the bracelet being compromised. Like all jewelry of the CADEAUX JEWELRY Cities line this bracelet is gender neutral, meaning that it can be worn by women and men. An 18 Karat gold clasp with a double safety feature provides for easy wearing and removal, without the risk of the bracelet inadvertently falling off the wrist. Ring Aachen has a similar profile as ring Hamburg, however, its outer ring band features a more decorative pattern of rectangles, pave-set with diamonds and surrounding highly-polished inlaid gold segments. 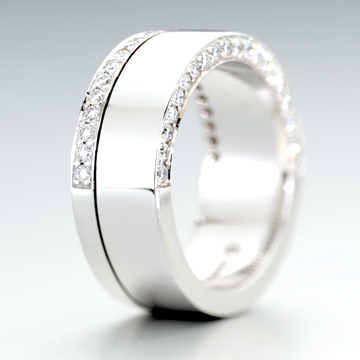 The ring’s outer pattern is continuous all around conceptual features outer circumference, giving it a consistent look in whatever position it is is worn. It is made of 18 karat white gold with diamonds, though it may also be made as a multicolored ring, for example with rose gold segments. The design is gender neutral and popular as a band that can be worn daily and on all possible occasions. Every poweful idea has a tendency to expand until its conceptual features become so conspicuous that they draw the attention of even the most superficial observer. 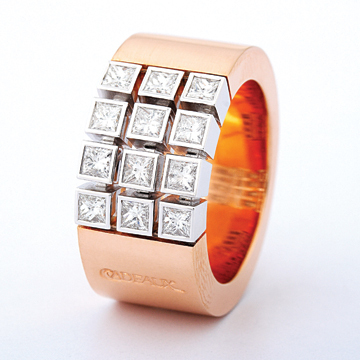 Ring Karl Der Grosse magnifies material with its 3 vaulted 18 karat gold girders and their intermittent channels set with princess-cut diamonds, plus a solitaire set at the pinnacle of the ring. Unmistakable expressions of rank and status. The ring’s name is a tribute to Charlemagne 742-814 C.E., pater Europae, the emperor who united Western Europe and gave rise to an era of cultural and intellectual development. The designs and models shown on this webpage and the associated copyrights are the property of Cadeaux Ginkgo AG, Switzerland.